It’s been a couple of years since the Palm Pre was released. Since then HP has bought Palm, then announced they wouldn’t release any more phones and then released more phones. So the biggest release of the current crop is the Palm Pre 2. Looking very much like the original Pre it sports WebOS 2.0. Is the familiar boring or an old friend? The Palm Pre 2 comes with 7.9 cm (3.1 inch) multi-touch screen at 320×480 resolution. The screen is clear and the colours are vibrant. Looking at pics and movies on the device is quite nice despite the small screen. The camera gets an upgrade to 5 megapixels with LED flash which is welcome but not too impressive. The camera isn’t bad but compared to Palm’s rivals it’s, like a lot of things on this phone, looking dated. Eight megapixels is becoming the standard. Inside you’re looking at a 1GHz Snapdragon processor and 512MB of RAM. This is… about average sadly. The fact that the operating system is so quick and so good at handling multiple apps means that it rarely struggles. Storage-wise the phones internal drive has been doubled to 16GB. Overall you’re looking at one average phone. Genuinely there’s nothing to write home about here and while none of the internals will significantly harm your use of the phone, it’s still a major factor hindering it from being one of the top handsets on the market. Some of the issues with the original Pre have been rectified with the Pre 2. The battery life is significantly better lasting a couple of days compared to the original Pre’s ‘up to a day’. The inductive back panel comes with the Pre 2 whereas you had to purchase it for the Pre but you still need to buy the Touchstone charger. I hate to sound horrible (do I?) but this phone looks no different to the original Pre and then the Pre Plus. Seriously, my thoughts back then are the same as now. The curved screen has been changed to a flat glass one and the slider is smoother and stronger. It looks ok. Nothing special, not cool and kind of dated. The keyboard looks like a kid’s toy, and I think the screen is too small. I don’t hate it. I just want so much more when I spend hundreds of pounds on a phone. Why can’t Palm come up with some new designs instead of tweaking the original? Surely we’ve got to the point now where they can make significant changes. Granted some people like a QWERTY keyboard, similar to the Blackberry Torch with the slidey, but this is strictly a business phone. It’s a smartphone still aimed at consumers. The screen is, for me, too small. I find 4.3 inches to be a great size with 3.7″ the minimum but this falls way too short at 3.1″. Watching movies is OK, but browsing the web is hindered. WebOS is by far the best multitasking operating system there is. 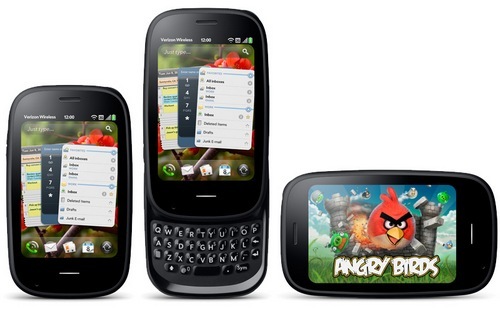 The thought put in by Palm to develop WebOS means that it’s easier to use than any other. The main strength is the fact that after opening an application, you hit the home button and then you have the apps appear as ‘cards’. You can look through the apps and pick the one you want to use while the others stay running in the background. In order to close an app, you simply flick the ‘card’ off the screen. It’s that simple. The other thing is you can have around 8 apps running at a time before you start to feel serious lag and encounter problems. Something the iPhone wishes it could do. The quality of the apps is up there with Apple, although the choice is still limited (see below). Nevertheless the apps that are available are of such quality that when you get a good one, you’re not going to need to try many. WebOS also has the ability to integrate information from different sources such as Gmail, Yahoo!, Facebook, LinkedIn, and Microsoft Outlook (via Exchange ActiveSync). The calendar is also clever and integrates calendars from multiple sources. 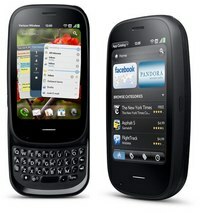 Compared to the other operating systems, WebOS is the one that I feel is easiest to use as well as being the most fun. I don’t mean fun in a games or widget way, I mean fun in that the way you interact with the OS, such as flicking apps off the screen, is a joy and not a chore. There have been subtle improvements such as the ability to group cards, like adding them to a folder. It’s just a neat way of organising your apps. The menu also gets an organisational update with the ability to group apps onto different screes and you can also remove screens. The biggest improvement is the ‘universal search’ which has been renamed ‘just type’. And it’s exactly that, you just start typing from the home screen and the option pops up to search the internet, your contacts and any other data, create a text or email etc. SO if you were to write an email you would just need to start typing instead of opening the app first, very neat! If you look in the app library, there aren’t a lot of apps but the apps that are available are good quality, but you have to pay for them. It’s kind of crap really. There isn’t a huge selection of free apps to choose from which makes it costly. Palm have been trying to beef up their app library for a few years now, their latest attempt is to make it easier for developers to port apps onto Palm. But the real change will come with HP’s muscle. HP are determined to make this work not only for the smartphone series but also their tablet range. It remains to be seen what will happen but HP will pump money into this and populate the app library. I know I have spent most of this review pointing out what’s bad about this phone and how it’s not as good as others but I do still love it. I loved the original Palm Pre and despite things not changing much since, the simplicity of the OS makes it a joy to use. Would I buy one? Hell no. This phone hasn’t moved with the times and I want my phone to be powerful in every department, to have a library of apps that give me proper choice. I like using this phone for a day or two but I couldn’t swap it for a top of the range Android or an iPhone 4 simply because it’s limited. So to answer my question above, is it too little too late or the start of something new? Well, it’s definitely too small and too late. If the next Palm smartphone matches the top of the range Android in terms of hardware and the app library gets an influx (which it looks like it will) then it’ll be a force to be reckoned with because the OS is fantastic.